I'm not really much of a fitness junkie everyday, but I am always loving the happy hormones that are released whenever I do my favorite exercise- Zumba. I love Zumba cause it feels more of a dance that you enjoy, instead of a workout. So for the greater news, 4.0 Events Management is taking a giant leap forward and moving to our next Zumba Fitness Party event, DANCE, RECOVER, REPEAT. It’s a three (3) hour pre-summer beach themed Zumba® Party with the famous and finest certified instructors and active ZIN (Zumba Instructors Network) members. Intensify the energy with celebrity Dance Master Joshua Zamora and beats by DJ InanX. Following the unparalleled success of its two Zumba Fitness events happened in 2014: “FUSE,” a two-hour Zumba Dance Marathon held on September 26, at the CCP Folk Arts Theater that featured more than 100 Certified Zumba (ZIN) Instructors from all over Luzon and joined by 3 popular Zumba celebrities Regine Tolentino, Joshua Zamora and Ray-AN of G-Force; and, a collaboration event with Lifeline Foundation and Food For the Hungry “Dance for Life: Dance Unite” – Dance for a Cause for the benefit of Yolanda-stricken areas, held on November 22, at Quirino Grand Stand, Manila. In 2015, 4.0 Events Management promises to continuously create a unique and energizing event while promoting Health and Wellness and fulfilling its commitment to take the Art of creative vividness in Dance Fitness-Party that’s moving thousands of people toward great happiness and health. 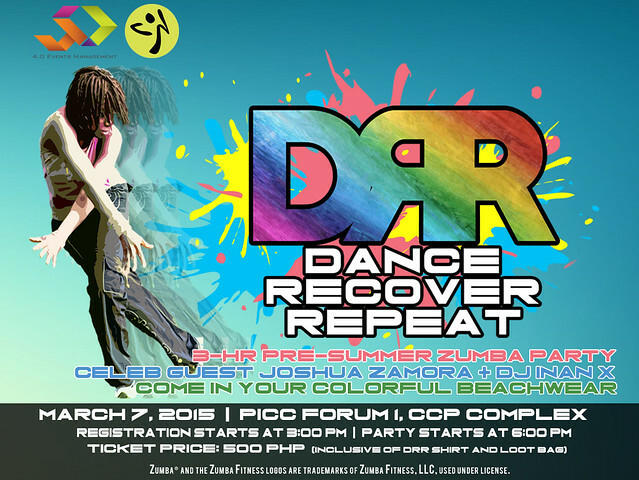 DANCE, RECOVER, REPEAT will be held on March 07, 2015 at the Phil. International Convention Center (PICC) Forum 1, CCP Complex, Pasay City. Registration starts at 3:00 PM Zumba® Party starts at 6:00 PM. 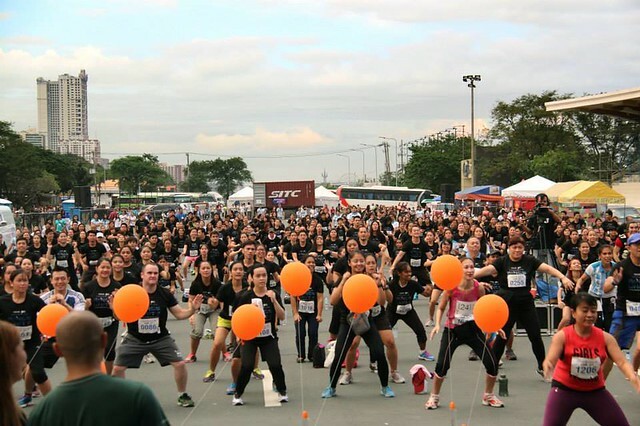 The venue will be filled with more than 1,500 fitness enthusiasts from different fitness centers, schools and universities, call centers, government and private companies and individuals who can live up to the fitness party! Ticket price is at P500, inclusive of DRR Shirt and loot bag. For ticket inquiry and reservation, please call 02-2166074 and 0917-5128211 or email us at 4.0eventsmanagement@gmail.com or martin@4pointzeroevents.com. We look forward to seeing you at the PICC Forum 1 on March 7.